Indigenous land for dubious dams? Activists, monks and villagers from Areng Valley fight against the construction of the Stung Cheay Areng hydroelectric dam. The Areng valley in the Cardamom Mountains has become a contested area due to hydroelectric dam proposals that would entail massive negative impacts on people and the environment. The area is inhabited by the Chong people, an ethnic minority of the traditional Khmer people (Khmer Daeum), who are said to live in the forests for more than 600 years . The Cardamom Mountains are also a well-known biodiversity hotspot, providing the world largest habitat for Siamese crocodiles and other 31 endangered species [1;2]. Since 2006, three Chinese companies showed interest in developing the dam, which is one of 17 dams the government plans to construct in the next 20 years to cover energy needs and to become a main energy exporter in the region . However, the site was shown to be largely inappropriate for dam development  and consequently, the first company stopped their intentions due to moral reasons and the irreversible social and environmental costs the project would entail . The second company lost interest after the project seemed to result economically unviable. However, the third company, Chinese giant Sinohydro, decided to move forward in spite of feasibility doubts and dramatic social and environmental costs . According to newspaper reports, the deal was brokered by ruling party (CPP) senator Lao Meng Khin, involved in other controversial development projects, and further well connected to the logging industry . According to environmentalist group Mother Nature, the project is moreover motivated by related timber logging groups, which would gain access to Cambodia’s prime forests and luxury rosewood due to clearing the area for the reservoir . (Illegal) rosewood trade is a million-dollar business in Cambodia . The dam will lead to the replacement and destruction of livelihoods of 1,500 people from nine villages and the flooding of 10,000 to 20,000 ha primary forest [1;2]. Downstream communities will be drastically affected by loss of riverside agriculture and swamp forest fishery . Buddhist groups fear that with the loss of forests, also their spirits will lose their homes . While large social, ecological, economic and cultural costs thus will be carried by local communities and the environment, profits will benefit mainly external actors, such as foreign construction companies. Moreover, most of the energy is planned to be exported to neighboring Thailand and Vietnam [1;2]. After 40 years of operation, dam ownership will be transferred to the Cambodian Government; however this is exactly when maintenance costs usually start to rise significantly . Protests and resistance by local communities, monks and environmental activists have increased significantly. In 2013 they founded the local NGO Mother Nature, which started campaigning against the project . On March 4th, 2014, a group of monks from Phnom Penh started a 240km protest march to the Areng Valley to support the communities. However, resistance activities faced repression. 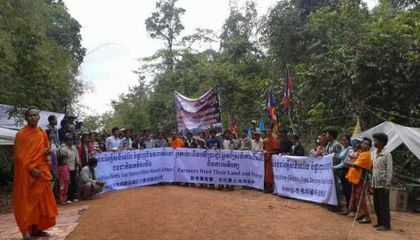 On September 15, 2014, 11 environmental activists were detained for blocking a governmental convoy and the Cambodian army was stationed at the construction site to protect the project . Activist and co-founder of Mother Nature Alex Gonzalez-Davidson was threatened by the Government to leave the country, denying him renewal of his visa , while others are facing summons . The prime minister said the decision to proceed has been postponed to 2018, and meanwhile, feasibility studies will be conducted . Other ministers however stated earlier that the project will go on . Project Details The hydroelectric dam has a planned capacity of 108 Megawatt . This corresponds to an energy provision for 87,000 US style households during rainy season. Provision however will go down to 46% of capacity during dry season, when Cambodia’s energy demand however is the highest . Investment size was reported to amount to 327 million US dollar . The company working as consultant (impact assessments etc.) is Sawac Consultants for Development. Mother Nature; Khmer Youth Empire; Independent Monk Network for Social Justice. Why? Explain briefly. It is not yet clear what the outcome will be, though currently it seems that the project will go on. Mother Jones online article (19/10/204): "Will Cambodia Flood a sacred and Biodiverse Valley for a Dubious Dam?"